Geeks2U provides expert computer repair service and support across Australia. Geeks2U was going through a growth spurt. They were looking for a solution to boost morale and gather candid employee feedback to quickly respond to workplace concerns. We work hard to foster an inclusive workplace where everyone loves coming to work. We work even harder to ensure that every single one of us always remembers who we work for and who keeps us all employed - our customers! We signed up for TINYpulse shortly after we formalized our Core Values. It was a time of fast growth in the business and quite a bit of change came with that. We sensed some morale issues in our contact centre and thought TINYpulse would facilitate the kind of frank, honest feedback that we felt was needed at the time. We introduced a fortnightly, company-wide meeting in conjunction with TINYpulse and noticed an immediate improvement. It allowed us to find out about any cultural issues - however small - straight away and then address them openly and transparently at one of our meetings instead of letting them fester. The organization enjoys having Cheers For Peers, a peer-to-peer recognition tool that anyone can use to give a virtual pat on the back. Geeks2U leverages a variety of different channels to spread the cheers across the organization, helping to create a more robust, positive environment. Our experience has been that the ‘virtual pat on the back’ between colleagues that Cheers for Peers facilitates is invaluable. Employees no longer receive positive feedback from just their manager, but now their coworkers too, and it’s had a tremendous effect on the team as a whole. Cheers for Peers allows team members to acknowledge their colleagues – anonymously or publically – for something they’ve done to help them, something they’ve done well, or even for something as simple as them being a nice person to see around each day! We try to share them in several different ways. There’s a TV in our breakout room broadcasting the virtual feed of all the cheers that have ever been submitted. We also read the most recent ones out in our fortnightly all-hands meeting and share them in a weekly email update about TINYpulse. It’s an even closer team now that everyone can thank one another and celebrate each other’s achievements in such a friendly, public way. Thanks to employee feedback about how much team members enjoy using TINYpulse, Geeks2U leverages it in their recruitment materials to showcase what an open, transparent, and positive organization they have. And, they proudly share their happiness metrics to prove that they are a great place to work. It’s because of feedback like this that we incorporate TINYpulse as much as possible into all of our recruitment material. We mention it in all of our recruitment ads and talk about it on the ‘join our company’ page of our website as well. We publish our all-time employee happiness scores and positive feedback that we’ve received from staff through TINYpulse on that page too. TINYpulse asks everyone how happy they are, on a scale of 1 to 10, every 4 weeks. 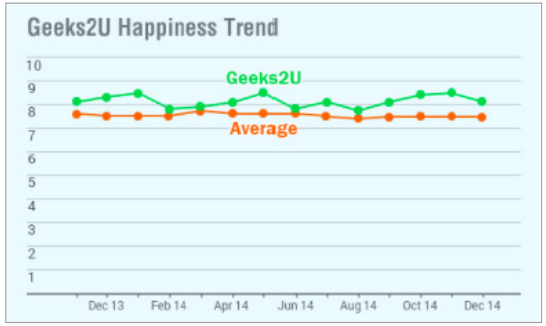 We gladly share a graph of our all-time results to show the difference it’s made to our employees’ happiness.